With an ever growing number of nations and private organisations rallying the path of Blue Economy, the Smart Ocean concept is becoming a reality. And Autonomous Unmanned Surface Vessels (AUSV) can be part of it, from a data gathering perspective. In order to reach that point, the challenge for the industry is to provide the means to collect data faster without any compromise on quality, and to make the process affordable and accessible to the greater number. It means progressively but actively integrating new assets and multiplying the number of devices in the water within a tight budget. An equation AUSVs could help solving. This article has been brought to you by iXblue. With that in mind, iXblue, an international high technology marine company, launched a new multi-purpose craft. The goal is to provide a more efficient data gathering solution in the ocean sciences domain, in every way. From costs control to the expansion of working domains. The Moon’s surface is better mapped than the Earth’s seabed. Who has not heard this? It might have become a triviality, but it remains reality. A reality that needs to be addressed today, given the ambitious challenges of mapping the entire ocean floor by 2030. The key factor here is not sensors technology, as it is available. The number of assets available, however, is far from sufficient to complete this Herculean task. The alternatives are either to build a massive new fleet of research vessels or to develop new methods of data collection and maybe to allocate a bigger workforce to the post-processing of the resulting vast amount of data. The first option is not realistic given the budgets at hand. The latter basically mixes a greater number of sensors in the water, the use of a larger number of assets, and the inclusion of non-specialised existing vessels. This is where AUSVs can be a key factor. They should be effect multipliers and should be able to work together with the existing research fleet, thus reducing survey times. But not only that. AUSVs should also be able to expand the vessels’ working domains. 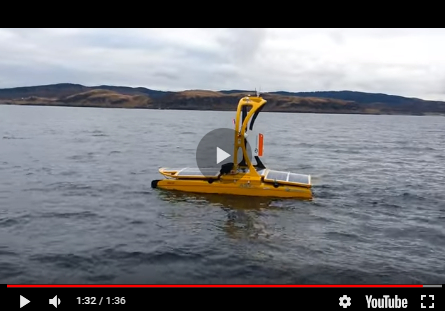 DriX, iXblue new multirole AUSV, is capable of working along with a research vessel in joint survey operations, both in coastal environments and on the high sea. Thanks to its totally ‘unmanned’ concept, maximum seakeeping and stability qualities have been given to the design. DriX thus achieved perfect quality seabed mapping images at speeds in excess of 10 knots during sea trials. This revolutionary design also enables DriX to work when the research vessel has to stop because of the weather and to collect data much faster than other AUSVs. Another cost control solution is to make use of non-specialised, already existing vessels to gather the information. But fitting them with geosciences equipment can be very costly, sometimes not very reliable, and the data quality might not reach the level of expectations. However, it would be much safer to use them in easier, but equally important tasks, such as support vessels or command and control centres for AUSVs. That is another milestone the AUSV would have had to pass: being fitted for deployment on a non-specialised vessel and operated and supported by it. This requires at the very least a deployable Launch and Recovery System (LARS), adaptable on non-specialised vessels anywhere in the world. Ideally, it would also imply that the AUSV be fast and have enough endurance to keep pace with the supporting vessel in case of space limitation on the work deck and in case of multiple AUSV operations from the same support vessel. Once again, this model makes sense and the industry already provides it. DriX has a top speed of 15 knots in order to reduce transit times, as well as 7-days endurance, which reduces the periods of replenishment at sea. Its LARS allows it to deploy/receive it safely from any kind of non-specialised vessel, provided it is fitted with lifting equipment (crane or A-Frame) with the right clearance. And as far as logistics is concerned, a 40-feet container, deployable everywhere, can accommodate both the DriX and the LARS. Enhancing existing assets and reducing the data gathering time are great solutions for smarter sea operations. But another way to control costs is for the AUSVs to be truly multirole in order to conduct a wide range of sea operations from the same craft. In essence, AUSVs need to be versatile in order to make the aforementioned qualities available to a greater number of situations. This means that they must be agile too, reducing the timeframe needed for swift mission reconfigurations. For instance, interrupting a seabed mapping mission to start echo sounding measures will require a change of sensors, antennas and electronic cabinets, all in an acceptable timeframe. DriX plays that part perfectly. Thanks to its changeable gondola and the easy access to its electronic cabinets, DriX offers a swift and easy switch of payload in a reduced timeframe. AUSVs will thus play a key role in this new Smart Ocean concept, but we need to be cautious with how we proceed to accompany this trend in order not to try and precede it. This is what iXblue does by using sea-proven technology, compliant with current international regulations, while keeping the door open to technological advances. In other words, companies need to create solutions fitted for future technological changes, but not with experimental technologies.